→PLA vs ABS: What’s the difference? PLA and ABS are the 2 most common FDM desktop printing materials. Both are thermoplastics, which means that they turn into a soft, moldable state when they’re heated and become solid when they’re cooled down. Through the FDM (Fused Deposition Modeling) process, both are melted then extruded from a nozzle to create a final print layer by layer. PLA is short for Polylactic Acid which is a biodegradable (under certain conditions) thermoplastic which is derived from a renewable resource like corn starch or sugarcane. It’s very popular among bioplastics and is using for many manufactured goods like plastic cups and medical implants. ABS is short for Acrylonitrile Butadiene Styrene which is a type of thermoplastic that’s commonly used in the injection molding industry. It’s used in manufacturing things like LEGO, electronic housings, and automotive bumper parts. On the other hand, PLA has a 37 MPa tensile strength, 6% elongation, 4 GPa flexural modulus, 1.3 g/cm3 density, a 173℃ melting point, a 60℃ glass transition temperature, and is biodegradable under certain conditions. The price of its spool of 1 kilogram, 1.75 millimeters is $22.99. It’s commonly used for making plastic bags, cups, and cutlery. The main properties of ABS are that it has a 27 Mpa tensile strength, 3.5 – 50% elongation, 2.1 – 7.6 GPa flexural modulus, 1.0 – 1.4 g/cm3 density, an amorphous melting point, a 105℃ glass transition temperature and it isn’t biodegradable. The price of its spool of 1 kilogram, 1.75 millimeter is $21.99. It’s commonly used for making LEGO and electronic housings. 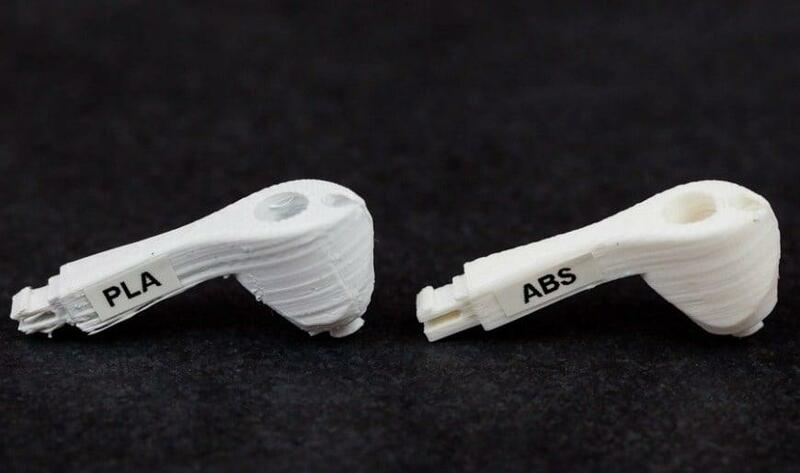 Both ABS and PLA are similar in that they can be used to print dimensionally-accurate parts. They can print details as small as 0.8 millimeters as well as minimum features down to 1.2 millimeters. If you want to print interlocking or connected parts, a tolerance of 0.5 millimeters is recommended and using a wall thickness of at least 1 – 2 millimeters to guarantee the strength in wall elements. The only difference is that PLA is less likely to warp during the cooling down process, so it’s relatively easier to print with. This also means you can print sharper corners and features with it compared to ABS. The tensile strength of both materials is similar so both are suitable for many prototyping applications. PLA, on the other hand, is more suitable for rapid prototyping when your main concern is the form and not the function. ABS is often preferred because it has more ductility than PLA. It also has a higher flexural strength and more elongation before breaking. This makes it suitable for end use applications. The layers are still going to be visible after printing whether you’re using ABS or PLA. This is due to the nature of printing with FDM. On the other hand, PLA has a semi-transparent finish which gives it a glossier look. You can also sand or machine PLA, but you’ll need more care and caution. ABS’s finish is usually matte. However, it becomes a little glossy when Acetone is used in the post-processing to smoothen it. It can easily be sanded and often goes gets machined such as getting drilled after printing. The bed for PLA is optional. Its temperature should range between 20°C to 60°C while its printing temperature should be 180°C to 230°C. An enclosure is also optional. Unfortunately, it can occasionally clog the nozzle. It produces little to no fumes, so it’s safe to use practically anywhere. To use ABS, a bed is necessary. Its temperature should range between 80°C to 110°C while the printing temperature should range between 210°C to 250°C. An enclosure is recommended although not mandatory and it never clogs the nozzle. Its fumes are quite intense with a bad odor, so the room needs to be well-ventilated. A drawback to PLA is that it can lose its structural integrity and may deform or warp if you put it under a load –especially as it approaches 60°c. ABS is more suitable for higher temperature applications as it has a glass transition temperature of 105°C. PLA is characterized by its stability in general atmospheric conditions and becomes biodegradable within 50 days if put in an industrial composter or 48 months if it’s left in water. It can often be found in food-related items. Before you use it for that purpose, however, make sure you check the confirmation of the filament manufacturer that it’s safe to do so. Sadly, ABS is not biodegradable. It is, however, recyclable. Generally, ABS and PLA are the most common materials for desktop FDM printing on the market. They don’t differ that much in cost either. ABS beats PLA when it comes to mechanical properties. It’s harder to print with, however. On the contrary, PLA is perfect for 3D prints where the look of the product is important. It’s easier to print with because of its lower printing temperature which makes it suitable for parts with fine details. If you’re looking for strength, machinability, thermal stability, and ductility, you should go for ABS. If you’re worried about your 3D model getting warped, go for PLA as ABS is more likely to warp.